Gerrit van Honthorst was one of the painters who introduced the Caravaggesque style into the Northern Low Countries. Among the artists of the School of Utrecht he was the best known internationally. Honthorst travelled to Rome at an early date, around 1610‒15, and is documented following his return to Utrecht in July 1620. He was successful with regard to clients and commissions in Italy, where he studied the work of Caravaggio and the Carracci. His nocturnal scenes, which may have been influenced by those of the Bassano and Luca Cambiaso, earned him the nickname of «Gherardo delle Notti». The subject of the present canvas is Italian in origin and can be associated with the work of Bartolomeo Manfredi, one of Caravaggio’s Italian followers. Dated to the period immediately after Honthorst’s return to Utrecht, it reveals the transformation of his style over the previous decade. The light is more coherent in comparison to his earlier works, bathing the picture surface in a more uniform manner. The light source, in this case located on the left, gently illuminates the background while it shines more strongly on some areas of the figure such as the bare shoulder, the arm raising the glass of wine and much of the face. This light creates fine passages of backlighting such as the hand in the foreground and the violin that the figure grasps under his arm. The lighting is one of the elements that gives this composition its force, while another is the treatment of the figure, whose happy mood is conveyed in the radiant gaze that attracts the viewer’s attention. 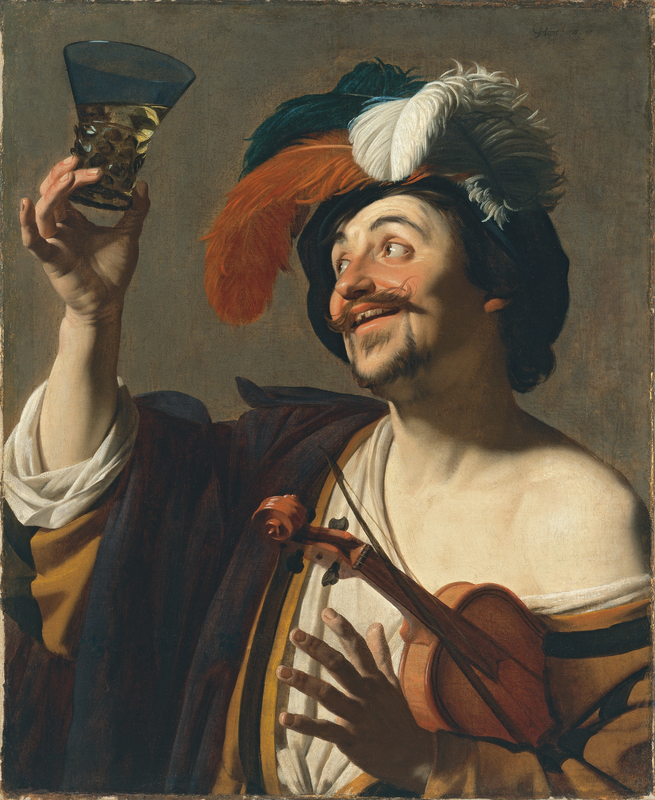 The painter has paid great attention to every detail in this anonymous figure, with his bright red nose and cheeks and red fingers that delicately raise the glass. The musician is dressed in theatrical dress and wears a plumed hat. The subject and date of this canvas has led the painting to be compared to another in the Rijksmuseum, Amsterdam, of 1623 in which the figure has attractive drapery and a similar hat to the present one. Judson considered that figures of this type might be allegories of the senses, in which case the present example would be that of Taste. Gaskell drew attention to similar compositions that have pairs in the form of female figures. According to Gaskell, these figures establish a dialogue of gestures involving sexual connotations. 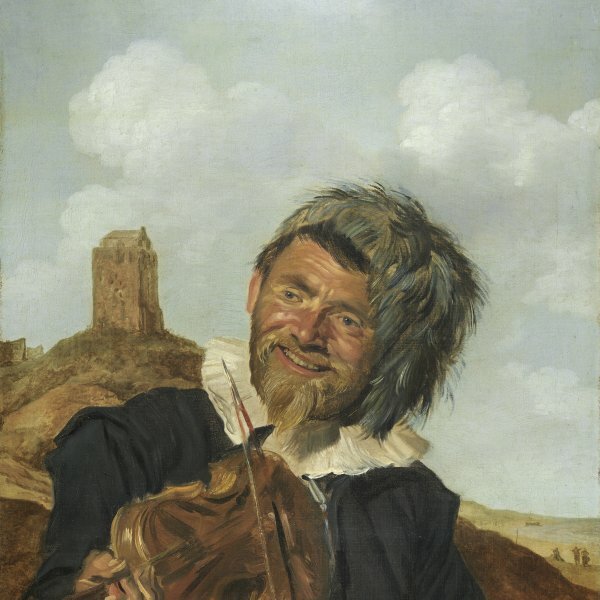 The happy Violinist was in various Viennese collections in the 19th century. It appeared on the French art market in the mid-20th century with the Heim gallery in Paris from where it was acquired by Earl C. Townsend Jr. for his collection in Indianapolis. It entered the Thyssen-Bornemisza collection in 1986.